Bloom! is Seattle’s Green TED – an evening of innovative speakers working in sustainability: social, environmental, and economic. Eight speakers, including our very own Marja Preston, will have eight minutes each to inspire us with their stories, and the bar will have all night to inspire us with their cocktails. Get your tickets for Thursday, February 7th! They’ve got a serious rockstar lineup for you talking about the likes of nuclear power, cupcakes, commercial and residential development, food forests, and re-inventing the toilet. 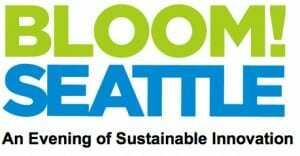 To learn more about the speakers, see the Bloom Seattle website. Get your early bird tickets here. Because of Bloom’s history of selling out, they have moved to a larger venue in downtown Seattle: 1927 Events (1927 3rd Ave).